When it comes to website development, the prevailing amount of users start hesitating between multiple web building tools. This is what makes the comparisons of these services so important. Having read the reviews of the most crucial parameters of the systems you are interested in, you’ll feel more confident about your choice. Today, we are going to talk about the differences and distinctive features of two website builders – Wix and Google Sites. Wix – is the world-popular all-in-one website builder that covers a broad spectrum of users’ web building needs. The system can boast a set of advanced features like Artificial Design Intelligence, Ascend, hundreds of responsive templates, powerful design customization tools and versatile pricing plans to fit any budget and web design needs. Google Sites – is a websites builder, which is quite simple to master for all users categories. The system also provides a reliable hosting platform and creates intuitive web building environment. The feature set it offers is quite simple and works well for the development of ordinary websites for everyday use. Even though, both systems make it possible to create full-featured projects, it still seems quite strange to compare the world-renowned service like Wix with the less well-known Google Sites platform. It’s quite clear that Wix is more feature-rich, functional and intuitive. The point is: what are the reasons that make it stand out from the crowd and are there any things it can cope with that are impossible to complete with Google Sites? Is the difference between the platforms really worth the money in the long run? Which service – Google Sites vs Wix – is more preferable for a certain target audience? It is high time to make that clear now. Let’s Go. Wix. Wix is currently one of the most user-friendly and intuitive website builders with a visual editor. It comes with a convenient drag-and-drop option supporting in-line website editing that results in the stunning WYSIWYG web building experience. The service structurally comprises the Dashboard (the place, where you adjust the major website settings) and the Editor (the area, where you actually work on your website development in the WYSIWYG mode). By the way, Wix Editor lets you apply Parallax Scrolling effect to your project to boost the impression it makes upon users. All in all, the entire system environment is designed in the same graphic style, including the apps. This creates the feeling of interface unity, which makes it simpler to get used to it. Regardless of the notable amount of options, even a user with zero web design experience can master this website builder. It will take around several hours to memorize the positions of elements and system sections as well as to learn how to make the edits, add new functions and design the pages, using the available widget collection. See also: Wix review – an in-depth review of Wix, where I discovered all nuances of the website builder. Google Sites. Google Sites is similar to the Pages text editor, when it comes to interface. What you will see is the document you will work in and 3 sections of options to the right realized through the tabs. Web page management does not differ a lot from editing a report with formatted text and media elements. This is a one-page interface. Everything that is not included into it, further appears in pop-up windows without any transitions. This happens on the same screen. It is no wonder that this service is super easy. Elements and options you can use are visible at a time. It is even theoretically impossible to mix something up here. It takes from half an hour to one day to explore the service depending upon your interest and experience. See also: Google Sites review – a detailed review of Google Sites website builder with all the pros and cons of using it. Wix vs Google Sites. As far as we primarily focus on the ease of use in this section, then the leader is obvious – this is Wix. The interface of the system is simple, functional, intuitive and user-friendly. Users can clearly see the result of their work due to the WYSIWYG website editor. This matters a lot for non-techies, who are just exploring the system and, thus, appreciate an opportunity to make the required edits before website publication. Wix. Wix is the all-in-one web building solution applicable for the development of different types of websites. It allows creating company business websites, portfolios, landing pages, forums, websites of restaurants, hotels, commercial and non-profit organizations, events, online stores of physical and digital products (photos, music, video, files), gaming websites, blogs and other project types. Such versatility of functional features is achieved through a rich set of widgets, large choice of available applications (that is, modules), code integration options, absolute positioning of web page elements (without the necessity to consider the network and neighboring elements) and flexible settings of each block (background, animation, fonts, layout). The undeniable highlight of the website builder is its advanced Wix ADI tool. The Artificial Design Intelligence feature helps users create decent websites with a few clicks only. It provides step-by-step guidelines and sets of questions, which help users automatically created websites using the submitted answers and content. The feature will be of great help to first-time users, who cannot boast rich web building experience yet have the intention to launch full-featured projects. For those users, whose coding skills are on a decent level, the system offers an opportunity to apply a standard Wix Editor to manually create and manage quality websites. Additionally, Wix has a mobile editor, the use of which makes it possible to create and edit the mobile version of your website without affecting the desktop variant. Wix also stands out from the crowd due to its powerful Turbo feature. Wix Turbo is a set of technologies and tools applied to cut down the overall website load time. This becomes possible due to the implementation of technologies and features that optimize browser rendering time without impacting its performance. The website builder also boasts extensive blogging options that let you create and update a blog any time you wish, write and schedule posts, enable user comments, select unique blog designs, set up SEO parameters etc. Likewise, Wix boasts a powerful eCommerce engine, allowing you to launch and manage small-to-mid-sized online stores. If you wish to add performance to the project you work on, feel free to reach Wix App Market. This is the place, where you can browse multiple widgets, extensions and add-ons to further integrate them into your website. The widgets available here are free and paid. It’s up to you to select the required elements. See also: How to get your Wix website ranked well on Google – a complete Wix SEO guide. Another crucial feature of the website builder is Wix Ascend. This is the advanced all-in-one business solution that encompasses all the business tools you may need to build a professional project. All in all, there are over 20 products available here, which can be effectively used to start, manage and promote your project. All the tools are carefully subdivided into sections and groups based on their purpose and indication (you can browse customer interaction tools, website promotion tools, marketing options and more). Wix Code – a unique web app builder – is another advantage of the system that will come up to the needs of all user categories. It enables everyone to launch and edit web-based applications without the necessity to demonstrate coding skills and awareness of programming basics. Google Sites. Google Sites is not used to create public websites only. It is also used to design internal and intranet websites. This service ideally works for team work on project development. You have a large selection of web-based Google applications, including Documents, Sheets, Calendar, Gmail etc. This makes it possible to add documents to the pages, charts, presentations, images, diagrams, YouTube video forms, maps with specified location etc. from the cloud. In other words, Google cloud applications are used as widgets (content providers) for Google Sites. By adding an element to the page (video, document or presentation), you get a block, the dimensions of which can be regulated with regard to your needs. One block may contain several elements, like a title, video and description in the random order of their positioning regarding each other. Content formatting tools are standard and include a font, color, list, alignment, link. It is possible to create multiple pages, each of which will be found in the upper menu. There are no SEO settings here as well as an opportunity to connect a domain to your website. You can add any number of users for cooperation and visual data exchange, create online resume or publish documents with media elements for public access, for example. Google Sites is worth using for such tasks, not more. Wix vs Google Sites. The services are meant to solve different types of tasks. Wix allows creating appealing commercial websites with complicated functionality, writer blogs, websites of game developers or musicians with online payment acception option as well as eCommerce projects. Google Sites is a lightweight solution to support communication and data sharing within the team. This is one of the parts of an extensive Google cloud tool set along with applications for documentation management, maps etc. When it comes to the feature set, Wix is definitely the leader, which is quite understandable. A specialized paid website builder is much more functional as compared to a free packaged application from Google. Wix. Wix is a niche leader, when it comes to the quality of ready made templates. Actually, it offers the best designs in the contemporary web design market. The overall number of themes currently exceeds 550 templates, which are mobile-ready by default and fully customizable. If you expect better template quality, you can manually customize the selected design by using the system editor. One click only is enough to let the system automatically adjust the template to fit all types of mobile and desktop devices. The template gallery is regularly updated to offer users advanced designs. 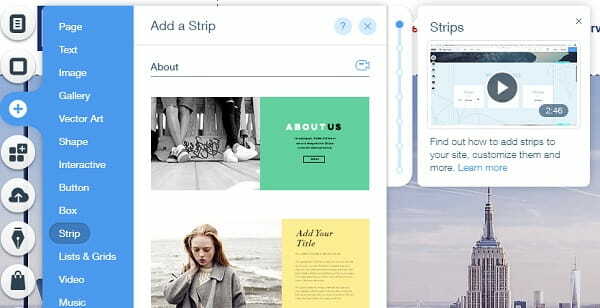 If you don’t manage to find a suitable theme among the samples Wix provides, there is a possibility to pick a blank template and customize it from scratch. To edit the designs, you can add new blocks, integrate widgets and extensions, set up layer parameters, apply multiple effects, animated backgrounds and other elements depending upon the niche your website belongs and the result you wish to avail. Mind that you won’t be able to switch the templates, while working on your project because of the absolute element positioning feature Wix offers. See also: Real Wix website examples – see my handpicked collection of Wix websites powered by real users. Google Sites. Google Sites doesn’t have a stock design gallery. Instead, you will be offered 6 simple themes, which change the fonts page scheme and make it possible to choose the main color of elements. As a result, web pages will look similarly from the designer point of view. They will have the same color and font style. An opportunity to color the blocks in the similar way or set your own background image adds diversity here. There are no other design customization tools. Google Sites pages may visually differ from each other due to the difference in the element combination and their positioning relative to each other. All websites created with the platform look very similar. The difference is in the content and its formatting. See also: Google Sites examples – take a look at modern websites made with Google Sites. Wix vs Google Sites. When it comes to design comparison, there is a clear distinction between a professional website builder and a simplified application for corporate intranet. 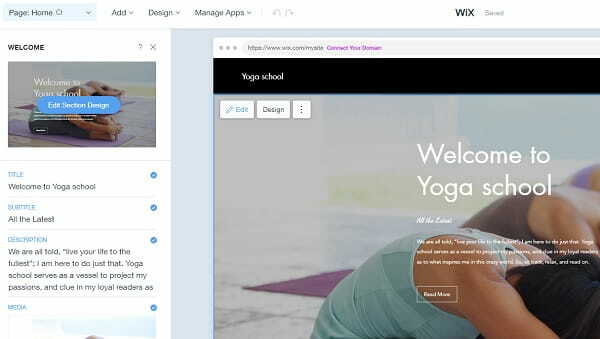 It goes without saying that Wix comes with all the advantages of a full-featured system – a perfect set of mobile-optimized designer templates, advanced customization tools and opportunity to create your own themes from scratch. Wix. Wix offers a powerful support center, which includes the YouTube channel, a forum, the extensive Support Center and impressive FAQ section. Smart search option allows finding answers to almost any questions a user has. If you still do not manage to do that, you can try using a ticket system. When working on website development, you will see the question mark above each editable element. Just hover over it to get the required info about the use of the specified element and tips on its practical application. The knowledge base of the website builder is rich is educative how-to videos and step-by-step manuals that are clear and understandable right from the start. If there are still any questions left, you are welcome to contact Wix experts via email. Google Sites. Google Sites comes with a reference section designed in the brand style, which is laconic, simple and understandable. You can also visit Google Sites help forum, if needed. Google Sites vs Wix. Tech support of the systems is realized differently because of the distinction between the platform types. Wix offers more reference materials and grants access to communication with the developers. There is nothing to compare, when analyzing this criteria as Google Sites is a free cloud application. Yes, you will be offered 10 GB of disk storage space for your files, you would be allowed to connect your own domain, add favicon and set up the simplest SEO. But that’s all. These poor opportunities prove the only fact: the system was not created to design commercial websites. You can use it for free for the unlimited time interval. 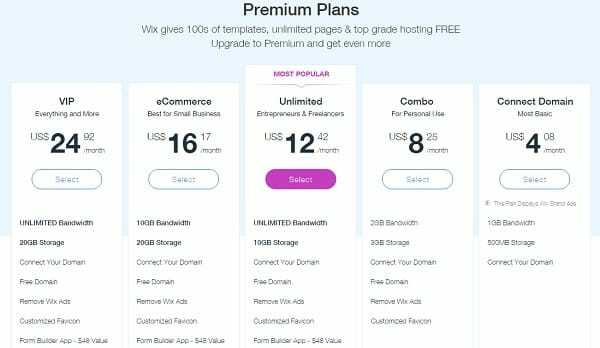 Wix can also offer an everlasting free plan, which does not differ from that offered by Google Sites in its terms: you will get functionality and disk space, but you won’t be able to connect your own domain. However, you’ll be allowed to set up SEO and other features. Wix additionally offers several paid plans, which make it possible to create an online store, connect domain name to the website, extend the volume of the disk space, get useful applications as a bonus etc. All in all, the website builder has 5 paid subscriptions, the cost of which starts with $4.50/mo for the cheapest Connect Domain Plan and goes up to $24.50/mo for the most expensive VIP Plan. Mind that the Connect Domain Plan doesn’t remove the system ads from the website. To get rid of them, you’ll have to upgrade to the Combo Plan and higher. Wix additionally offers several paid plans, which make it possible to create an online store, connect domain name to the website, extend the volume of disk space, get useful applications as a bonus etc. See also: Wix Pricing Plans Review – read about Wix paid subscription options. The functionality becomes more advanced, when using paid plans. That’s why, Google Sites doesn’t have any chances to win the comparison. High frequency of promo campaigns, offering discounts for paid plans. It’s desirable to have an opportunity to import products from CSV or XML files, which is not available yet. Wix is not an ideal website builder, but it certainly strives to be the best. High development rates allow it to be the leader in the niche, creating promising prospects for users. Small faults are invisible on this background. Google Sites is initially worth the praise due to its intuitive nature. We haven’t come across a simpler web building service yet. This is the essence of its attractiveness. Access to the full set of Google Apps allows creating web pages with diverse content, formatting them as standard documents in text editors. Can you design visually appealing documents? If so, then it will be easy for you to master Google Sites. You can use files from the brand cloud storage, including images, videos, documents, charts etc. This is very convenient. Websites are responsive, which is also a benefit. Just like any other cloud application from Google, you will grant the chosen access type to your colleagues or friends. The service doesn’t have any disadvantages in terms of the specified features – everything works great here. However, Google Sites loses its attractiveness for businesses outside of its cozy environment. This is the major disadvantage of the system: you won’t be able to create a website, which will help you make profit (sell, attract clients, promote something etc.). It is impossible to manage a blog, create a forum or an online store, design an appealing gallery etc. in the system. There is much you cannot do here. This is a problem, which won’t let you take Google Sites seriously. Which option – Wix or Google Sites – is a more preferable web design solution and for whom? Both website builders make it possible to create and publish websites. However, the approaches they use, the feature sets and the major system parameters let us clearly realize that the systems differ a lot. Even the comparison of the options of free versions makes Wix a more preferable variant for all user categories. This is not to mention the advantages provided by the paid plans. Wix is a perfect website builder for users, whose web design expectations and endeavours go far beyond ordinary web development objectives. The system is currently the best in the niche, offering superior functionality, advanced design customization tools, huge collection of templates optimized for mobile viewing and one-of-a-kind design editing solutions. Google Sites is a website builder that notable lags behind Wix in terms of functionality and visual presentation. The system may work well for simple projects that do not imply integration options or complex web design solutions. The comparison of these two platforms clearly indicates the winner – Wix. 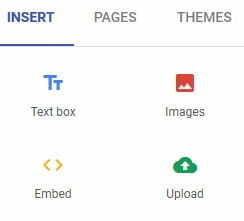 If you still have any hesitations, mind that Google Sites will mostly appeal to those people, who are actively using Google Apps in the team work mode. You can manage the projects and share the best practices in cooperation with your team members here. However, if you intend to create complex commercial websites with advanced performance and unrivaled visual impact, then Wix is undoubtedly the top choice.